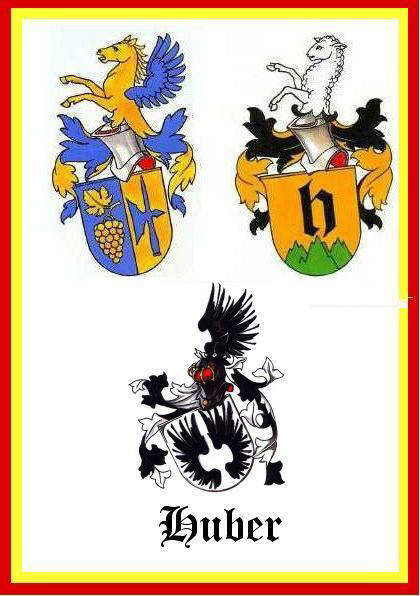 The HUBERS from Embrach/Aesch-Neftenbach are the oldest known Huber-family in Switzerland. The name already occurs in 1272 in the Urkundenbuch der Stadt und Landschaft Zürich, Band 4, p. 211/212. A Hub, Huob or Hueb is a piece of land with a surface of 30-50 Jucharten (10,8-18 hectare, 1 Juchart = 2 1/4 acre); large enough to support a mediaeval extended family: farmer and farmer's wife, their children, farm hands and farmer's maids and their parents and parents in law. A farmer who held a Hub in hereditary fief (or owned it) was a Huber, Huober or Hueber. In 1452 the Hubers owned the farm 'Wagenberg' in Oberembrach (Historisch Biographischen Lexikon der Schweiz). They descend from Heinrich (Heini) Huber, born c. 1430, 'Gotteshausmann' or 'Gotzhusman' (vassal) of the Chorherrenstift St. Peter in Embrach. He married c. 1485 and died before 8 November 1518. The family has four branches: a Swiss (Embrach, Aesch/Neftenbach, Basel), a German (Trippstadt/Kaiserslautern), a Dutch (Rotterdam) and an American one. In the 18th century part of the American branch changed the name Huber into Ho(o)ver. The crest with the two wings (coat of arms of the village Altikon) belongs to the descendants of Heinrich Huber from Altikon, born c. (the churchbooks got lost in a fire) 1557. He was probably the son of Ulrich Huber from Altikon and Elisabeth Stulsatz from Dättlikon. He fought under the command of prince Maurits of Orange in the famous battle at Nieuwpoort (1600) against the Spanish army. On this branch 66 pages have been published in 'Nederlands Patriciaat (Dutch Patricians), Volume Friesland'. The third Dutch Huber-family descends from Jakob Huber, said to be born 27-04-1806 in Marbach, Canton Luzern. His parents probably were Johann Huber and Verena ? Jakob marries 13-01-1832 Cornelia Helena de Zwager. The Dutch family Hueber (with an -e in the name) originates from Innsbruck, Austria. This genealogy counts 2589 families, including rather comprehensively Corbeau, De Kiewiet, (De) Swart, Gloudie, Klapwijk, Van Gent and Van Vugt.